The Penguins weren't able to knock off the red hot Tampa Bay Lightning last night to extend their 4 game winning streak, falling to the Lightning 6-3. They'll look to get back on track tonight in the second game of a back to back against the Atlantic Division leading Florida Panthers. This is the second meeting between the two teams this season. The Penguins won the first game 3-2 with goals by Sidney Crosby, Evgeni Malkin, and Phil Kesselin leading the way. The Panthers have quietly gone from perennial lottery team to division leader, and a big reason why is the play of their young players. Top draft picks like Jonathan Huberdeau (3rd overall, 2011), Alexander Barkov (2nd overall, 2013), and Aaron Ekblad (1st overall, 2014) have been a big part of Florida's turnaround. Huberdeau (10g 27a) and Barkov (15g 19a) rank first and third, respectively, on the team in scoring, and Barkov has shown potential to develop into an elite center. Speaking of elite, Ekblad is well on his way to becoming one of the best defensemen in the league. Making the NHL as an 18 year old rookie, Ekblad posted an impressive 39 point rookie campaign and took home the Calder Trophy as the Rookie of the Year. He's fresh off his second All Star appearance in as many seasons in the league and currently has 10 goals and 22 assists on the season. Despite the youth movement, it's the oldest player in the league, soon to be 44 year old Jarmoir Jagr, who has been a key contributor for the Panthers and currently is tied with Huberdeau for the team lead in points with 16 goals and 21 assists. Fresh off an All Star captaincy that he jokingly predicted would kill him, Jagr has managed to continue to contribute despite being an age that a scant handful of players in league history have reached and managed to keep playing. He keeps climbing the all time scoring lists, placing 4th in league history with 738 goals and 1,839 points, needing just 3 more goals and 11 more points to reach 3rd on both lists. The Panthers during 5-on-5 action rank just 20th in the league with a score adjusted 48.0 CF% and have the second highest PDO in the league at 102.4, part of which is the league's 3rd highest shooting percentage at 8.7%. Great goaltending can hide some of the flaws in possession and allow a team a greater chance to go on the type of run that Florida has, but eventually the Panthers as a team are going to regress to the mean and see their 55.7 GF% swing back more in line with the possession numbers they're putting up. - Sidney Crosby inched closer to 900 career points with a 2nd period goal against the Lightning. If he records a point tonight in career game number 677, he'll beat out Marcel Dionne (678) for 10th fastest to the milestone all-time. He'd also become the fastest active player to 900 points against the player who currently holds the mark. 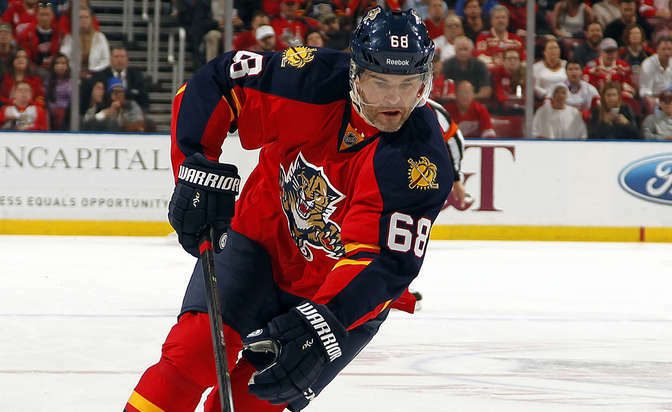 Jaromir Jagr accomplished the feat for the Penguins in his 681st game. - Matt Cullen took the place of the injured Evgeni Malkin as the 2nd line center, and he responded with a goal against Tampa Bay. However, the 2nd line was out for 3 goals against at even strength and Cullen (44.8 CF%), Hagelin (47.1%), and Kessel (41.2%) struggled with possession, an usual occurrence for the line that's posted a 60.1 CF% with Malkin centering Hagelin and Kessel. - It's been a rough 2 game stretch for Marc-Andre Fleury, allowing 9 goals on 37 shots during that time frame. He was pulled midway through last night's game against the Lightning, and with Fleury and Zatkoff both playing even minutes last night it remains to be seen who will be the starter against the Panthers.